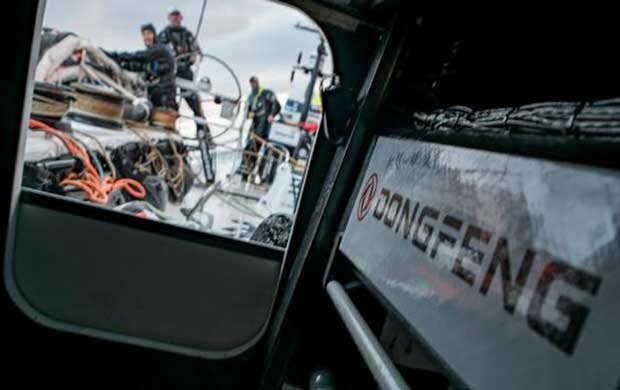 After a fast and furious opening to Leg 2 of the Volvo Ocean Race, the fleet is settling into a groove on Monday, with navigators and skippers already facing the first of many critical decisions on this race from Lisbon to Cape Town. Today will give us the first indication as to how far west the teams want to set up for their approach to the doldrums. “We’re planning another gybe to the west to take advantage of the shifts,” explained Juan Vila, the navigator on MAPFRE this morning with his boat charging south. And soon enough, the Spanish team made the right turn and as of 13:00 was the second furthest to the west. Only Dongfeng had hit the west more aggressively. “There’s a massive, multi-hundred mile long wind shadow behind Madeira so we don’t want to end up downwind of it,’ explains Turn the Tide on Plastic skipper Dee Caffari. Earlier today, Sun Hung Kai/Scallywag skipper David Witt and navigator Steve Hayles appeared to have a contrary view, charging to the south and positioned as the eastern most boat in the fleet. But shortly after the 13:00 UTC position report, they too gybed, and are still set up to pass – just – north of Madeira. The boats are sailing into familiar territory as Porto Santo, one of the Madeira Islands, was a mark of the course on Leg 1. But on this leg, the teams can leave the island group to either side. They should pass the islands this evening UTC. Today’s tactical game follows a relentless opening day of racing, with winds over 30-knots on the first night at sea, and a heavy ocean swell of four-metres. ‘Saw some crazy things today. A wave threw Bianca off the stack and into the cockpit while she was clipped in. So much water that her PFD inflated. There she was trapped on her back in the cockpit, stuck by her tether taking hundreds of gallons of water to the face. It was scary to watch. Liz got to her quickly and sorted her out. At this point in Leg 2, it is important to understand the tracker rankings do not account for tactical positioning. Instead, the tracker rewards southerly progress towards Cape Town. Boats positioned further south (and east), will be ranked higher, even if the tactical situation favours the west.